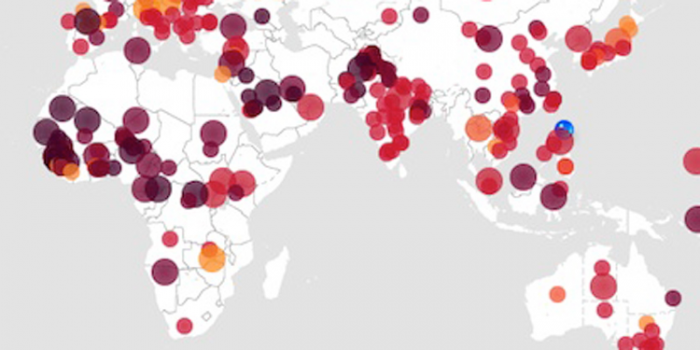 How Can Big Data Help Fight Ebola? Emergency response teams, health organizations, medical charities, national governments and non-governmental organizations have been actively fighting Ebola since its first outbreak in Western Africa in 2014. It has claimed thousands of lives and disrupted the lives of thousands more in the West African region. According to the latest report released by the Centers for Disease Control and Prevention, there are more than 26,000 cases of Ebola, out of which more than 10,000 have already died. In the light of such a catastrophe, it merits to see if technology can help in combating this disease. Specifically, can big data contribute to the fight against Ebola? The existing potential of big data and its past applications point to a resounding “YES” to the above question. Big data can help in identifying the regions that are heavily affected by Ebola thanks to the widespread use of mobile phones, even in the poorest regions of Africa. By monitoring the calls made from mobile phones to helplines, it is possible to identify those areas where there is an outbreak. In fact, mobile phones are the only reliable source of information in such places. With this information, governments and NGOs can setup health and treatment centers in such areas to reduce the number of deaths. Moreover, this information can help to contain the spread of Ebola by implementing the controversial travel bans between regions. This mobile mapping with the help of big data was tried on a trial basis. Orange Telecom in Senegal handed over more than 150,000 voice conversations and texts made from mobile phones to a Swedish NGO called Flowminder. With this information, it was possible to identify the regions that saw the most number of calls to the local health helpline. However, this was historic data because it was the first experiment of its kind. When big data is applied to real data, it is sure to provide meaningful insights into region-wise data. Using this data, it is possible to make the best use of existing resources such as healthcare workers and equipment. International travel has become commonplace. This frequency causes big problems especially in cases like Ebola that have a long gestation period of 21 days. As a result, Europe and the US are constantly on a state of high alert as they have implemented extensive screening at all airports. This screening can be supplemented with big data analytics to track the movement of infected people. It is possible to ascertain a pattern through big data to identify if people from an infected region travel to a specific country or port. Based on this information, it is possible to contain the further spread of Ebola. Big data analytics can also play a role in finding a cure for deadly viruses like Ebola. Using different big data tools it is possible to identify the genetics of a virus, why some people are more resistant to it than others, the mutation pattern of viruses and the reason why some strains are more deadly than others. All of this information can increase our understanding of viruses like Ebola, so that an appropriate cure can be found. In short, big data can play a big role in helping to combat Ebola by identifying the heavily infected regions, preventing its spread and helping researchers to come up with a cure earlier rather than when it’s too late.